Phillip Grubauer. Credit: Jerome Miron, USA Today Sports. At some point this season, most Colorado Avalanche fans can say they lost hope. Hope was lost that their beloved hockey team was going to regress and not make the 2019 Stanley Cup Playoffs. But, the team didn’t lose hope. Nathan MacKinnon, Gabriel Landeskog, Erik Johnson and the other 18 players that don the burgundy and blue never lost hope. The team that lost 3-of-10 games in the month January never gave up. With 11 games remaining, Colorado sat 5th in the wild-card race. The Avalanche amazingly snagged 18-of-22 points in those final games to crawl their way back into the final wild-card spot. Which leads us to where we are; facing the Calgary Flames in the first round of the playoffs. The playoffs that are no longer a pipe dream but a reality. It’s no secret that this team didn’t do well against the Flames in the regular season. Each of the three times the Avalanche and the Flames faced off it ended in a Colorado loss. Calgary holds a plus-4 goal differential from the regular season. 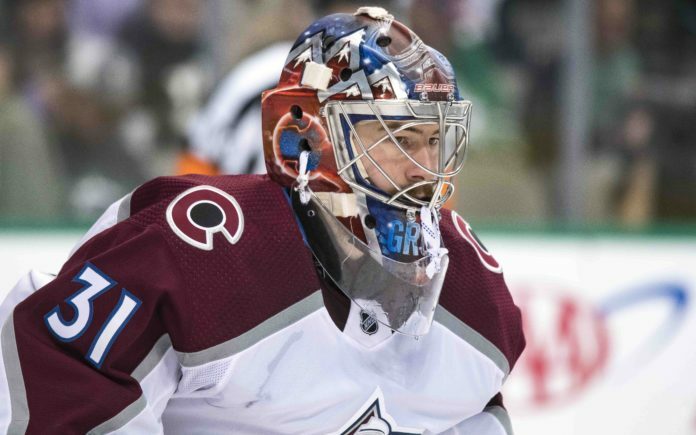 However, Seymon Varlamov started all three regular-season matchups against the Flames, with a .888 save percentage and a goals-against average (GAA) of 4.784. On the positive side, Colorado was able to score 10 goals on Calgary’s netminders, which isn’t bad over three games. The scoring was there, the goaltending, not so much. The last time these two teams met, Varlamov allowed four goals on 15 shots. Colorado peppered David Rittich with 35 shots, scoring only three times. That is not a scoreline which will win a single playoff game, let alone a series. As every avid hockey fan knows, anything can happen in the Stanley Cup Playoffs, especially when riding the play of a hot, experienced goaltender. The Avalanche are doing exactly that. Philipp Grubauer is one of the big reasons why Colorado is in the playoffs. In the final month of the season, Grubauer posted a 9-2-2 record, with a 1.56 GAA and .953 save percentage. That is the definition of a hot goaltender. Coach Jared Bednar recently confirmed he will continue to play Grubauer. Grubauer is no rookie when it comes to the playoffs, as he played a major role for the Stanley Cup-winning Washington Capitals last season. Which, of course, is one of the reasons Joe Sakic went out and got him in a trade in the offseason. Last season’s playoffs were the perfect example of why a strong backup was needed for this Colorado team. When Varlamov went down with an injury, Colorado looked to their backup at the time Johnathan Bernier. Bernier played well but got hurt himself. The Avalanche were left to rely on their third-string goaltender. Now, with two goalies that could both be starters heading into the playoffs, and one of them coming in absolutely on fire, Sakic’s decision looks prescient. The goal-scorers have proved that they can put the puck in the net against Calgary. The defense has shown that they can keep Calgary from shooting the puck, allowing only 16 shots the last time these two teams met. The only question mark coming into Thursday night’s game is the goaltending. If Grubauer can add that final element to this Colorado team, what looks like a tall mountain to climb might not actually be as daunting. Colorado and Calgary face off with puck drop scheduled for 8 p.m. MT and can be seen on NBC Sports Network.